Headshot of Microsoft CEO Satya Nadella. Satya Nadella with Bill Gates and Steve Ballmer. Satya Nadella with his son Zain. Satya Nadella in Redmond in 2014. Satya Nadella at a Redmond event in 2014. Satya Nadella in Melbourne, Australia, in 2016. Satya Nadella on stage in Australia in 2016. Satya Nadella speaks at an event in 2017. Satya Nadella presents to financial analysts in 2017. Satya Nadella gives an online presentation in 1993. 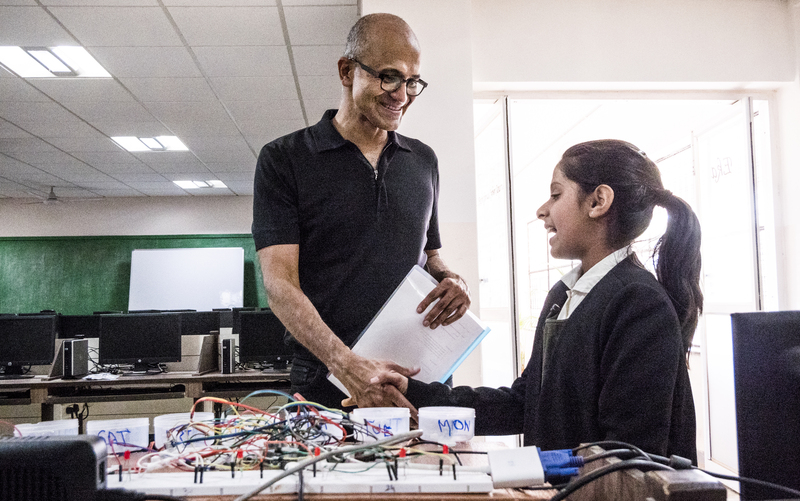 Satya Nadella visits his former school in India. A young Satya Nadella on the cricket field. Hit Refresh Cover - straight.